Should I Buy a New Car Online in Columbus, OH? If you're trying to decide if you should purchase your next car over the internet or at a local dealership, we hope you choose the latter. Online retailers provide consumers with another option to buy a car, one that is billed as more convenient. We couldn't agree more. More choices are better than fewer choices, and convenience is vitally important. With that said, we believe that Dave Gill Chevrolet is still the best place to buy your next car or truck. When it comes to convenience, looks may be deceiving! Online retailers claim to be the faster way to shop because they offer haggle-free pricing and will ship to your residence. What consumers give up, however, is the ability to test drive the vehicle and assess its condition PRIOR to purchase. Moreover, once you buy a car online through them, their service and care stop. What if you could get all of the benefits of convenience AND not give up anything in return? That's what we do at our Chevrolet dealership in Columbus, OH. Like other local dealerships (and unlike online retailers), we offer and encourage test drives! We want you to get behind the wheel and experience the car yourself, BEFORE you make an investment. But in doing so we place a high priority on convenience and flexibility. We are happy to meet you at your home or place of work - or wherever you'd like - with your vehicle of choice. Would you prefer to take one of our pre-owned vehicles to a third-party for a check-over? No problem. Would you feel better if you could confirm that the vehicle you want will fit in your garage? No problem. We know that consumers interested in a pre-owned vehicle want to know as much about its condition as the selling dealer, whether a local store or an online retailer. We give you that opportunity. Online retailers won't be there for you throughout the length of your ownership, and you won't be able to contact them when things go wrong. That's where Dave Gill Chevrolet comes in, because we'll look out for you and your car for many miles and years to come. Compare our pricing to no-haggle online retailers and you'll find our prices are lower. In addition, there's no need to negotiate with us, because we use advanced software tools to achieve Live Market Pricing, which means we price our vehicles at highly competitive levels compared to similarly equipped vehicles in this market. Online retailers charge higher prices, anticipating that you will pay extra for the same convenience we already offer. 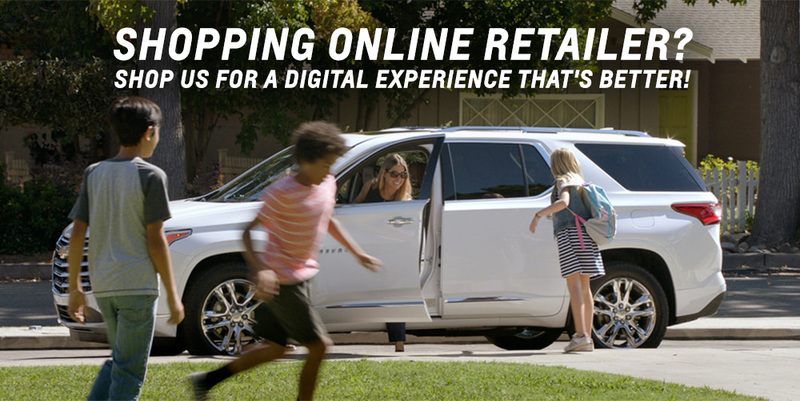 Are you trying to avoid a bad dealership experience by working with an online retailer? We know what you mean! When you buy or lease a new Chevrolet or a pre-owned car or truck at our Columbus Chevy dealership, you'll enjoy a personalized and stress-free car-buying process. But don't take our word for it. Check out what our customers have said about the Dave Gill experience in their Google reviews! We've faithfully served the Central Ohio region for over 35 years, and have treated our friends and neighbors with the respect and transparency they deserve. Dave Gill Chevrolet is the highest-rated Chevy dealer in Columbus, OH, because we're willing to go above and beyond for you. In fact, our dedication to serving you and your needs has led us to become a DealerRater Consumer Satisfaction Award winner and a repeat Edmunds.com Five Star Dealer. When you compare our dealership to online car-buying websites, you'll find that the value they offer pales in comparison. So gives us a try when you're shopping for your next vehicle. See for yourself how we can offer everything that an online retailer does, plus much more! Once you've considered our $500 Ohio State University student and faculty discount, free car wash with every service and friendly staff, you'll find that buying a car with us just makes sense. Visit Dave Gill Chevrolet to learn more and to schedule a test-drive today!